Step 1: Bind off the wrinkly, unattractive lace. 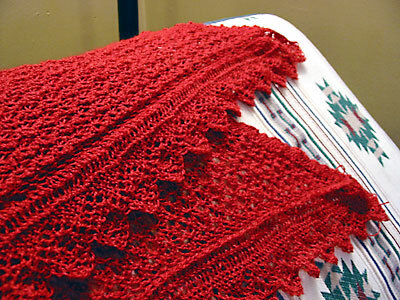 Drape across back of futon for photograph of said unattractive lace. Step 2: Soak for a half hour with a dribble of Eucalan. 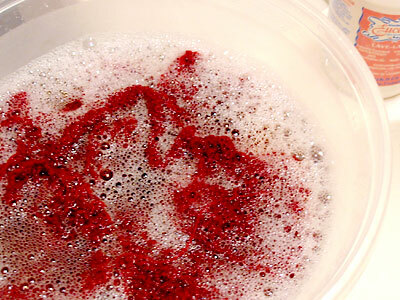 Step 3: Rinse for fifteen minutes until red dye stops bleeding into the water. Or at least stops bleeding enough that you think you won’t stain anything red. Confirm by wrapping shawl in towel and stamping on it. Step 4: Pin out with eighty gabillion pins. Manage to stick yourself only once, but stick yourself hard enough to draw blood. Figure the shawl is red anyways. 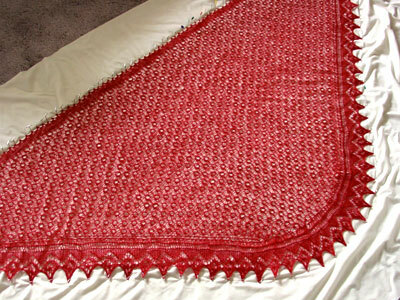 Finished pictures and my pattern comments as soon as I can find someone to take a picture of me modeling the shawl. CogKnition posted this on August 22nd, 2007 @ 9:32pm in Unfinished Objects | Permalink to "The Magic of Blocking"
Wow. Blocking is amazing. She’s going to be lovely.